Heart Mountain sounds like a lovely place, but it is a Japanese internment camp. Quarters are cramped, bare and cold. Food and employment are in short supply. Along with other Japanese Americans from San Jose, Nathan Mori and his family have been relocated to Wyoming for the duration of the Second World War. Nathan’s father, accused of being a spy, has been sent elsewhere and Nathan’s older brother Ken is too busy flirting with girls and trouble to shoulder the burden of their sick mother and crippled younger brother. Nathan longs for the loving home he once knew, but Aunt Kazuko’s dramatic pronouncements and authoritarian attempts to rule the roost are a poor substitute. The only bright spot in the camp is Lucy and the sound of her beautiful voice, but her eyes are on Ken, not Nathan. In addition to fetching, carrying and caring for young Emiko and Tom, one of Nathan’s responsibilities is to look after a gold watch. When the precious family heirloom disappears, Nathan is devastated. In one rash moment, he makes a choice that has consequences, not only for himself but for others in the camp. Eventually the war comes to an end, but Nathan’s losses are a permanent fixture. Up against prejudice and discrimination, the Mori family struggles to make ends meet. Nathan’s longing to return to life as it once was, or to make a new life hardly seem feasible. Can he move beyond grief and regrets and find love and faith again? 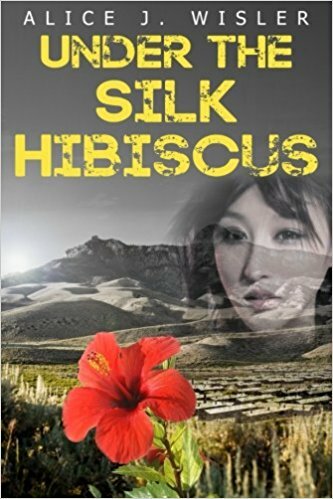 Alice Wisler’s Under the Silk Hibiscus is a tender portrait of a family’s survival through the toughest of times. Both a historical novel and a love story, woven with threads of faith and forgiveness, this book rings true with authentic, believable characters. A moving five star read.